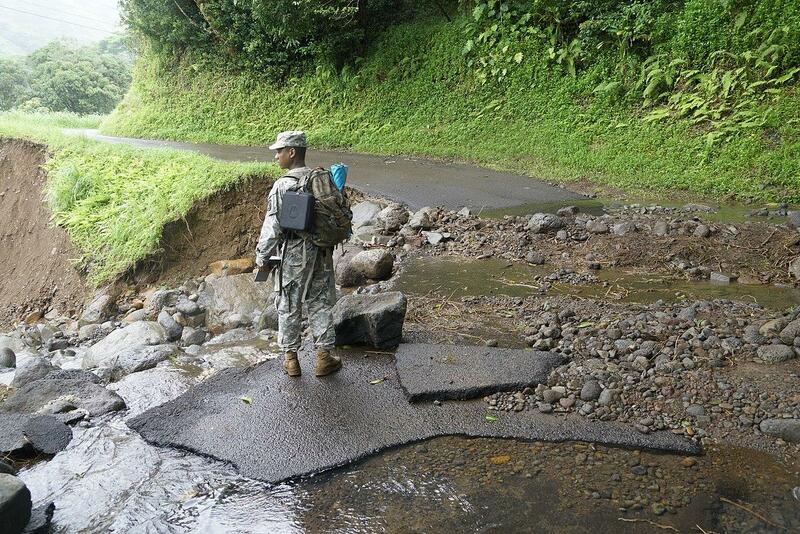 A Hawaii Army National Guard Search and Rescue Team member assesses the damage done in Wainiha Valley, April 17, 2018, Kauai, Hawaii. Now, the state Department of Transportation plans to phase-in the re-opening of the road beginning in May and plans to limit visitors when the Hāʻena State Park and popular Kalalau Trail is scheduled to re-open in June. Residents in the coastal communities of Wainiha and Hāʻena are worried it's too soon. They say Hāʻena park is not ready to accommodate the influx of cars, and the bridges along the route are still under repair. But federal funding guidelines require the highway be reopened once the road is operational. That will happen on May 1. However, there will be strict limitations, particularly for tourists. "If you love Kauaʻi and you love that area, you will do us a favor and avoid it for the month of May until we can get the park open," said Sue Kanoho, executive director of the Kauaʻi Island Visitors Bureau. "Itʻs just right now to add anything more in there is just hard on everybody trying to get eveyrthing done so we can open for the summer." Phase two of the plan to restore the area kicks in this summer, when Hāʻena State Park is scheduled to re-open "early-to-mid June," the state Department of Land and Natural Resources said, barring unforeseen delays. The department plans to implement a management plan to limit parking and visitor counts. Citing the impact of too many tourists on the park and its effects on local communities, the park said in a release Monday that it will begin taking reservations for visits and fee-based parking before the park reopens. A shuttle service from Princeville to Kēʻē is also set to launch. "For permitted overnight campers along the Kalalau Trail, the reservation system will function as it always has, and those with permits to camp will not be subject to the visitor limits," said Alan Carpenter, assistant manager for the department's parks division. "However, under the new management scheme, overnight visitors to the Nāpali Coast State Wilderness Park will not be able to leave their vehicles at Hāʻena State Park. They will need to take the shuttle or arrange for other transportation to the trail head." He said the Kalalau camping reservation system will be re-activated once the state finalizes the park's opening date. Carpenter advises visitors to purchase both their park reservations and a seat on the new shuttle "to assure the most efficient and stress-free visit." Kanoho said when last year's flooding occurred, the visitors bureau put out information that only a portion of the island was impacted. That coupled with tourist traffic which was diverted from the Big Island during the volcano eruption kept visitor numbers high. There have been growing concerns statewide about the number of tourists impacting popular visitor locations, prompting limits on numbers of tourists at Hanauma Bay and Haleakalā Crater.